Well I have to say, this has been another banner season so far for everyone on the river. With amazing adventures had and fish runs that have been very satisfying all user groups on the river are enjoying the great season. 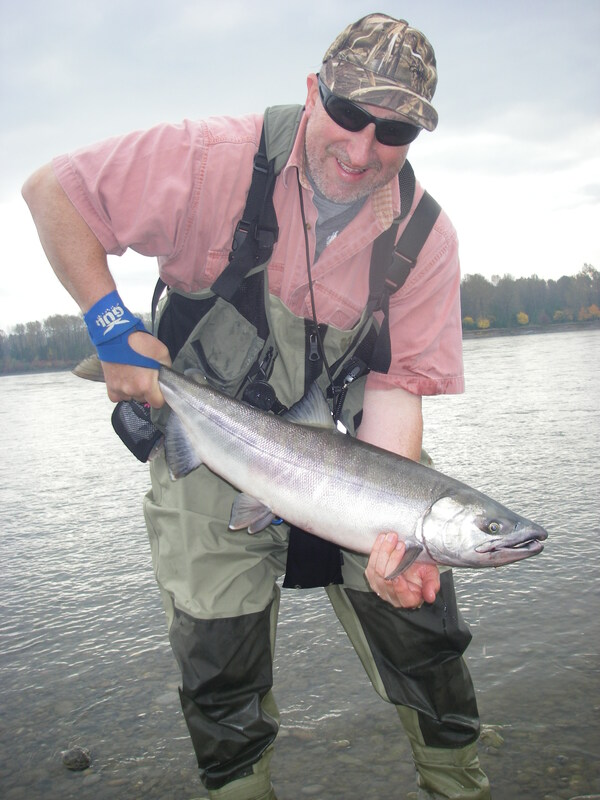 We are looking forward to more great days as the Chum, Coho and Chinook Salmon keep migrating up the river. Fishing should stay strong for salmon until the middle of November or even later depending on the run sizes of each species. Anglers from all over the world enjoy this part of the season where many options of fishing styles can be used to target Salmon. Bar Fishing is fishing from a fixed rod on the boat or on the shore. Most use spin n glo’s and sometimes roe. In the past this style of fishing was a way for many local anglers to socialize and also to spend good bonding time together for families. Spoon fishing is done on the shore, usually walking and casting. 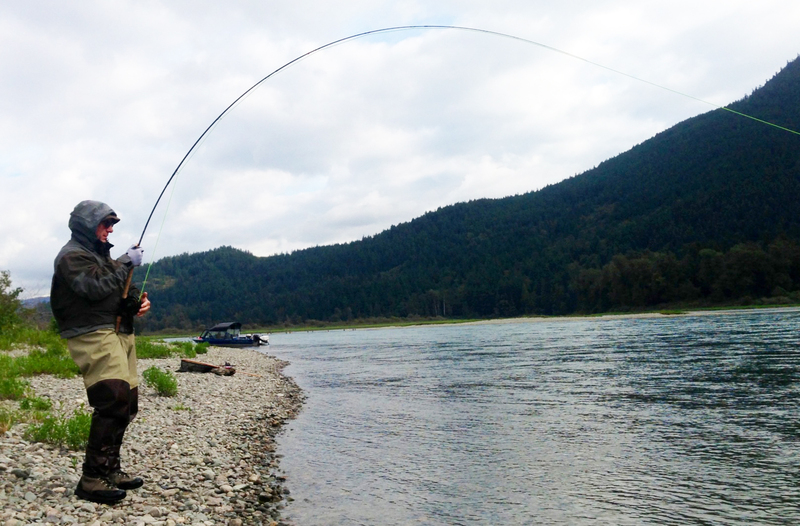 Moving water or ponds are great places and this is a great way to attract Coho. Chums are best targeted on spinning rods or casting rods, float fishing marabou jigs and or some Colorado blades with cherish beads and coloring. This is easy and lots of fun! 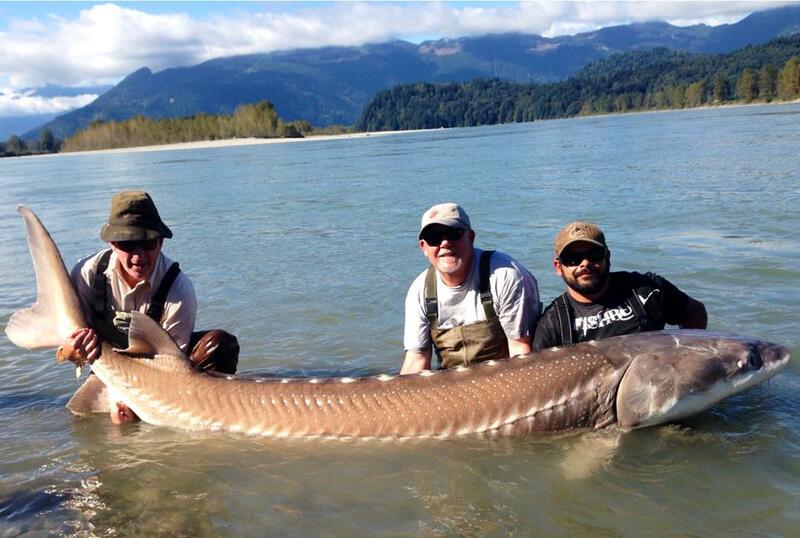 The Fall is another time when we have many UK and European anglers visiting for fly fishing. We are instructional and professional guides, who teach our fly anglers and potential learning fly anglers, all the techniques to get them going and to enjoy this magic sportfishing method. We have many rivers to teach on throughout the Fall; the Harrison and mainstem Fraser River are my two favorites. Coho are chasers in the Harrison and they can be a lot of fun, you must stalk them and when you find them it is incredible to see them launch at your offering. The mainstem Fraser is equally or even better as it is a fresh fish highway, picking a great location and finding one that produces well changes by the day and the week. Doing a little searching around pays large dividends if you are patient. Our favorite fly’s are muddlers, flash fly’s and Christmas tree’s – there are so many on the market that work and adding polar UV sure works a treat, even just a few threads in the fly. 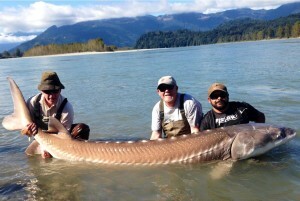 Sturgeon fishing has been very good, we had a little lull in the mid September weeks but were picking up fish on most every trip. Now the fishing in the Mid River (Hope to Mission) are quite aggressive and the best baits have been groundfish, roe, salmon pieces and lamprey. When you find the fish and they are on the bait, they are crushing it, “game on” in other words. The lower Fraser (Mission to Vancouver) has also been good to excellent, I have spent numerous days down there with good results in many locations such as Hannah Creek, Two bit, Ft. Langley, Billy Miner and Barnston Island. Best baits lower river have been lamprey, roe and salmon. For 2015 we are reinstating our Lillooet River Fly fishing Camp – it will run from early April to mid April – 21 days only and if you are interested in this, please let us know. There are only 6 spaces available each week – 3 day trip and also 6 day trips, including 2 instructional guides and our camp guide. This is a opportunity to fish and learn on one of the nicest pristine rivers in all of southwestern British Columbia. We supply most everything except your toothbrush. Incredible scenery, fishing and fun around the camp are a great team building adventure experience. Smaller groups of 2 will be considered but for an additional fee. Contact our sales team if you are interested or would like more information. I would also like to let everyone know that we are just about finished our new iphone app for the company – the Android one is finished and can be downloaded from the Google play store right now. In another month you can do the same with the iphone, we will get that announcement out when it is ready. Most wonder why we want an app, well truth be told this is the way of the future and handheld’s are leading the way in traffic to our website. 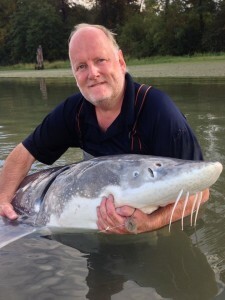 We will also be starting this winter for the 2015 Season the New GRFA Sturgeon Club. There will be some great incentives for clothing, trips and also to be registered for winning trips based on catches throughout the 2015 season and future years. 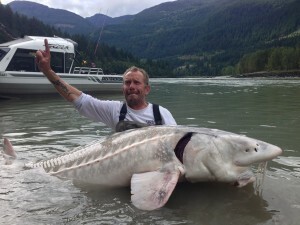 Awards and prizes will be announced at the end of each year and anglers meeting the target sizes will get special designed Sturgeon pins for keepsakes. I am very excited about this as is our entire team. The Fraser Valley Salmon Society (FVSS) has also just finished it’s Fraser River cleanup last weekend on Saturday September 27, 2014. It was a very successful day with loads of garbage being removed from the gravel bars of the Fraser River. Chris Gadsden and many others worked hard to plan the event and it was supported by many many other Chilliwack businesses. Kudos to all that participated! We know that the busy fishing season and the numerous anglers on the banks of the Fraser River will always leave garbage behind, but hopefully in the years to come education from groups like the FVSS will help to get a message out that leaving garbage behind is not acceptable. Once the river slows down and guiding too, we plan to do more work out on the river so that there is little or no mess left behind. If you see anyone polluting or dumping garbage, report this immediately and get down some details, a photo, date and time. Call the RAPP line at 1.877.952.7277 – if we don’t take responsibility no one will and enjoying a clean visit to the rivers around, would be a nice treat. 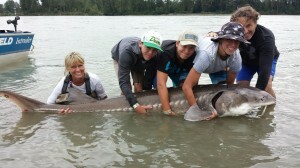 Lastly I wanted to mention the Ducks Unimited Canada Sturgeon Classic that occured 2 weekends ago. We had 30 anglers join us for 2 days of tournament fishing complimented with banquets, shore bbqs and even a poker night. This annual event is a way that we at Great River Fishing are able to partner up and give back to conservation and the environment. The monies raised over the weekend will go to projects throughout Canada that will benefit all of us for the future to come. 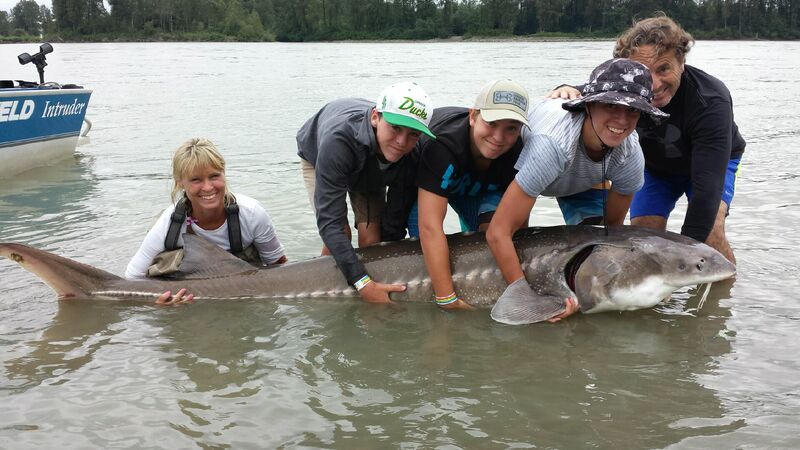 Luc Gason and his group with the winning fish! I would like to congratulate the winner of the tournament Luc Gascon who landed the largest fish of the tournament and won a trip for 2 to Uculet for a Salmon Adventure. 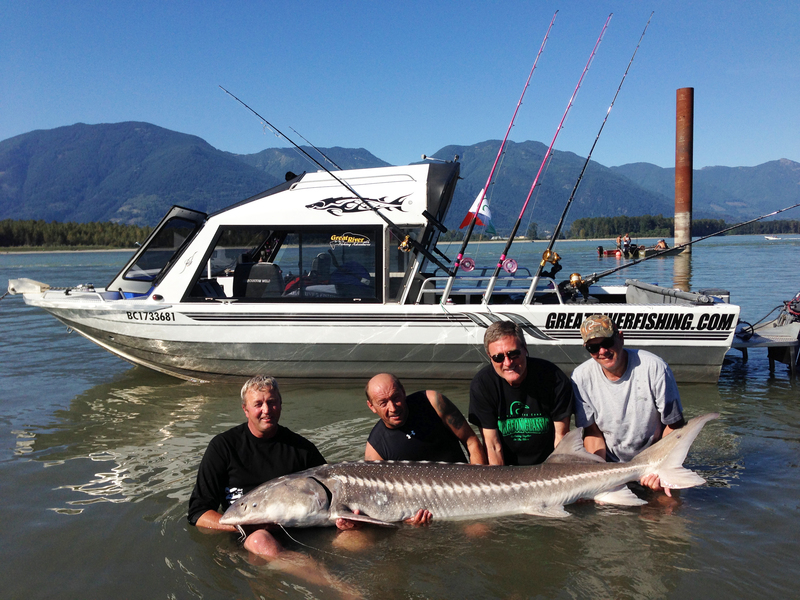 We will do our best to show you some of the greatest highlights from our fishing days. This is our journey of fishing through our eyes and our clients eyes, it is quite the life. Tell your friends and come fishing with our team here at GRFA.